On Thursday April 17th, David will be presenting at an invited lecture for the Dutch Aerospace Association, NVvL. The title of his presentation is “Understanding and supporting humans during vehicular control tasks: what aviation might learn from automotive”. 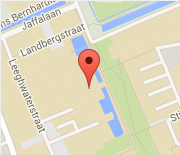 The talk will be held from 19:00-21:30 in the NLR auditorium (Anthony Fokkerweg 2, 1059 CM, Amsterdam).